As the dust began to settle on Wednesday's blockbuster indictments against nine Fifa officials and five corporate executives, one person emerged as the face of a long and complicated criminal investigation. And when the time came to announce the charges, Loretta Lynch did not mince her words. The United States attorney general said officials at football's world governing body had engaged in "rampant, systemic, and deep-rooted" corruption. After just a month in the job, Ms Lynch had landed an enormous punch. Suddenly her face was on TV screens and newspaper pages around the world. The Department of Justice would, she vowed, "root out misconduct" and "bring wrongdoers to justice". It was an extraordinary statement of intent from a woman whose nomination as attorney general had been frustrated for nearly six months as Republican senators blocked her appointment. And it was the payoff for an investigation she had spearheaded for years. Born in 1959 in North Carolina, with the odds stacked against her, Ms Lynch harboured a dream of graduating from Harvard. "As a child she was very inquisitive," her father Lorenzo told the BBC earlier this month. "She asked questions of everybody and about everything." Her dream became a reality in 1981 when she earned a first-class degree in English literature, before switching to law. She joined New York law firm Cahill Gordon and Reindel in the mid-1980s and was appointed as a prosecutor for the city's Eastern District in 1990. Nine years years later, she was US attorney for the district. It was in Ms Lynch's first year as district attorney that she caught her first really high-profile case. Abner Louima, a Haitian, was beaten and sexually assaulted by police officers. Amid a storm of public outrage, she prosecuted the officers involved, one of whom was sentenced to 30 years in prison. On one day, she had to be escorted out of the courtroom by US marshals for her own safety. Ms Lynch left the US Attorney's office in 2001 to become a partner at Hogan and Hartson law firm, where she remained until 2010 when President Barack Obama nominated her to return to her previous job as US attorney for New York's Eastern District. Then in November 2014, Mr Obama nominated her for US attorney general. "If there's an American dream story, Loretta Lynch is it," said Democrat senator Chuck Schumer at the time. In was in her role as district attorney that her involvement in the Fifa investigation began. Over the course of five years in Brooklyn - during which she weathered criticism for striking a deal with HSBC that spared the bank from criminal charges over money laundering - a case against the football officials was pieced together. "We always knew it was going to be a very large case," Ms Lynch told the New York Times. 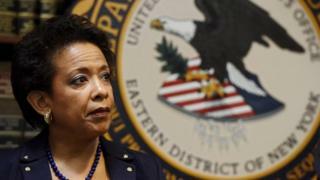 Veins in the network of Fifa corruption alleged by Ms Lynch ran through meeting rooms in the Eastern District and through banking systems across the country, the Department of Justice said. Working with the Federal Bureau of Investigation (FBI) and Internal Revenue Service (IRS), Ms Lynch used those connections to the US to bring the long-awaited indictments. After years of investigating, she stood up at a press conference in New York and boldly accused Fifa officials of "abusing their positions of trust to acquire millions of dollars in bribes and kickbacks". It was an extraordinary blow against an organisation that is alleged to have got away with bribery and corruption for more than two decades. "The pantheon of world soccer has a new hero," said Politico's Tunku Varadarajan. "To the names of Pele, Maradona, Cruyff and Messi, add another: Loretta Lynch. The US attorney general, confirmed by the Senate just three weeks ago by the most un-soccer-like score of 56-43, is destined to go down as the most consequential woman in the history of the game." Football fans around the world "should salute her", said the BBC's Matt Slater.